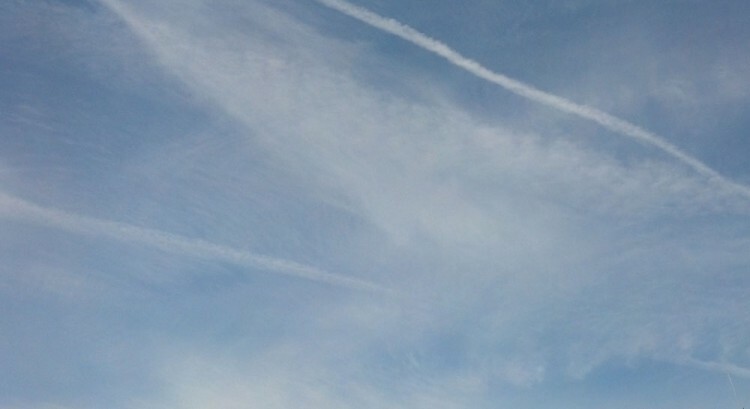 Yes, climatologists have looked at artificial clouds formed by contrails. “We know all about it,” they’ll tell you. But we humans tend to accept the first answer we find and we stop looking for evidence too soon. We draw a conclusion from a glance and move on. Climatologists (a broad term since they all tend to have different focuses and specific areas of expertise) consider the net radiative heat effect from clouds and determine that artificial cloud formation is insignificant in terms of contributing to “global warming,” and that there isn’t any more cloud cover now than there was fifty years ago. That’s wrong in so many ways that I’ll have to number them, because net radiative heat is only one consideration and several others impact weather and climate. So let’s not stop there this time. 1. Clouds trap heat and prevent it from escaping into space, and we have to consider that aircraft-spawned clouds are higher than natural tropospheric clouds– 20,000 to 40,000 feet. This means that there’s often a double layer of clouds at different altitudes creating more effective insulation. This high layer of moisture is largely the result of the roughly ten trillion cubic feet of frozen water vapor from jet exhaust, which is constantly present and providing an effective layer of insulation at night– even when it’s not visible in the form of reflective clouds– so even when these clouds don’t provide daytime shade, they provide nighttime insulation. 2. In the daytime, clouds obscure the sun and create shade, which drops the temperature on the ground. 3. When the temperature drops, the air contracts in the shaded region, which causes a drop in pressure. Pressure changes affect the weather too. 4. When the pressure drops in a shaded area, it creates wind because of the pressure differential. Wind also changes weather patterns. 5. At night, clouds prevent heat from escaping. That means cloudy nights are usually warmer than clear nights, so the ground doesn’t cool off as much before being heated by the sun again the following day. We discuss daytime temperatures a lot, but nighttime temperatures have increased by a greater percentage, and warm nights means less cooling down… which means it reaches higher temperatures in the daytime more quickly at the same levels of insolation (solar radiation reaching the Earth). That additional insulation from clouds also means that ice doesn’t freeze as much as it melts, compared to a century ago when we had lower CO2 levels AND an absence of artificial high clouds from aircraft. 6. When we seed the atmosphere before storms in so many places, we are creating a dense field of condensation nuclei for hot steam from jet engines to mix with at 20-30,000 feet as they ascend to their cruising altitude. These aircraft, contributing trillions of cubic feet of steam into the atmosphere every year, add additional ice crystals with every flight. This effect can snowball too until, as millions of witnesses have observed, clouds spawned by jet aircraft can cover the sky entirely. The common and global practice of cloud seeding prior to every rain or snowstorm (in all the western states in the US) helps to produce cloud cover before storms arrive, thereby not only increasing the storm’s volume, but also its velocity. Following the jet stream, these western rainstorms become eastern superstorms. More to the point, just observe: Artificial clouds from jet aircraft change the weather on a regular basis in many parts of the world. 7. We’re injecting superheated water vapor via jet aircraft into the lower stratosphere, which destroys the ozone layer, which may affect the amount of solar radiation reaching the earth. That is to say, the climate. 9. Salinity affects evaporation, and continued spraying and buildup of salt-based chemicals may affect the surface salinity and hence, evaporation and natural tropospheric cloud formation. 10. Models of climate change have been consistently wrong. No one has successfully predicted temperatures or weather globally, and even local weather predictions are only about fifty percent right. We can observe an overall warming trend in the Northern Hemisphere that seems problematic, but we cannot scientifically assign causation to “the building up of gases causing a greenhouse effect;” scientifically speaking, that’s correlation and not causation and we have no way to accurately estimate the amount of warming that’s caused by CO2. Most climatologists believe it because it’s what’s said, and because it makes sense based on the experimental data as well as the correlative data. What else could it be? Well, a lot of things. Clouds, for example. Lots of clouds. 12. Aerosols are small enough to permeate a membrane. That means everything we spray into the sky not only ends up in our soil and water… we also absorb it through our skin and lungs into our bodies, and the bodies of all breathing creatures, not to the mention potential direct effects of the metallic crystal-aerosols used regularly for weather modification on plants, molds and fungi, or microbial life. Okay, that last one isn’t so much about the climate. But I think you’d agree it’s a point worth noting, if you’ve read this far. And now “geo-engineers” want to reduce insolation and enhance Earth’s albedo (reflectiveness) by adding sulfur dioxide to the stratosphere? Guys. I love you but please– at least answer question number 11 before you recommend screwing with SRM techniques. Let’s superspect.